The purpose of this article is to give a detailed account of the hardware specifications of Trezor Model T (show for Trezor One). Trezor Model T is of approx 64 mm x 39 mm x 10 mm (2.52 in x 1.54 in x 0.39 in) in size and weights 16 g (0.56 oz). The case is made of a reinforced plastic providing great durability. The casing is put together using a method of ultrasonic welding. NoteThere are no connective bolts, nails, soldering materials, or adhesives holding the case together. 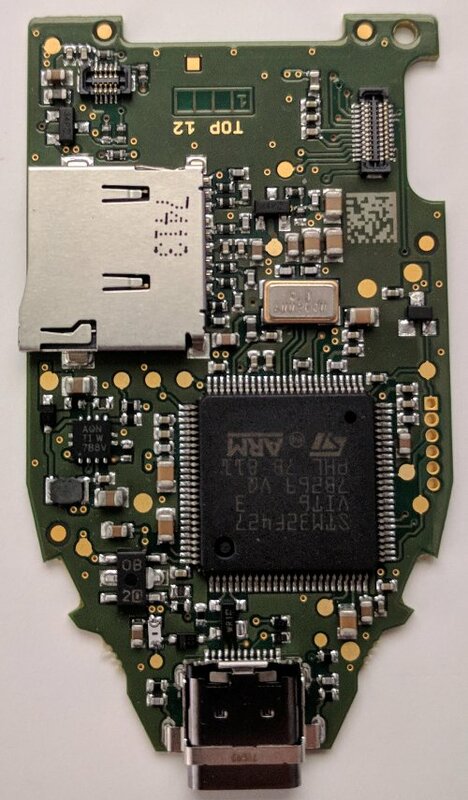 Trezor Model T is a USB 2.0 and USB 3.0 compatible device. The device wields a Micro USB (type C) Receptacle port in the bottom part of the unit. Other means of communication such as WiFi, Bluetooth, NFC, or even a fingerprint reader have been deliberately excluded to limit the possible attack surface. ARM Cortex-M4 processor @ 168 Mhzwith custom software. LCD touchscreen (240x240 pixels) used on Trezor T provides enough space to display the transaction details comfortably, requests for confirmation, warnings, or even simple images. The screen is an essential tool allowing the user to reliably check the legitimacy of entered data with no need to trust the host device(computer/phone). The touchscreen gives the user the ultimate control of the device. The necessity of physical confirmation has been implemented to protect the accounts from the vast majority of remote attacks. Using the touchscreen is the only way to unlock the device, enter the PIN, recover the existing wallet, and to confirm any other action. Trezor devices reliably operate in temperatures ranging from -20°C to +60°C (-4°F - +140°F). ImportantDo not attempt to force open, disassemble the case. Do not expose your Trezor device to extreme temperatures, fire, water, sand, vapors, humidity, or chemicals. The device is not waterproof or unbreakable. The Trezor devices are CE and RoHS certified, so they meet all quality, reliability, and environmental standards. X-Rays will not hurt your device, making it suitable for traveling by plane. For more information on standards and certifications including relevant declarations, please visit trezor.io. Hardware of Trezor device is open-source. If you want to build your own Trezor, there are fantastic guides available from the mcudev's website. This page was last edited on 10 December 2018, at 16:11.